Need something unique in pressure seal? Chances are, we can make it for you. If a stock item does not fit your application requirements, we can work with you to produce a Custom KingSeal Pressure Seal product. Some of the features we offer to meet applications are shown below. We can produce your order in up to six colors. Many marketing departments and firms prefer to use documents and communication vehicles utilizing process color. Combine the efficiency of a KingSeal mailing system with the eye-catching appeal of process color. Just contact us with your suggestions and we’ll work with you on your project! Choose from one or two consecutive numbers, MICR Consecutive, MICR Static, or any combination of these numbering options. Does your application need Modulus numbering? We can do that in several systems! In addition to 24 and 28 lbs papers, we can work with papers meeting USPS requirements for Post Cards and Double Post Cards, as well as requirements for other equipment such as time card readers. 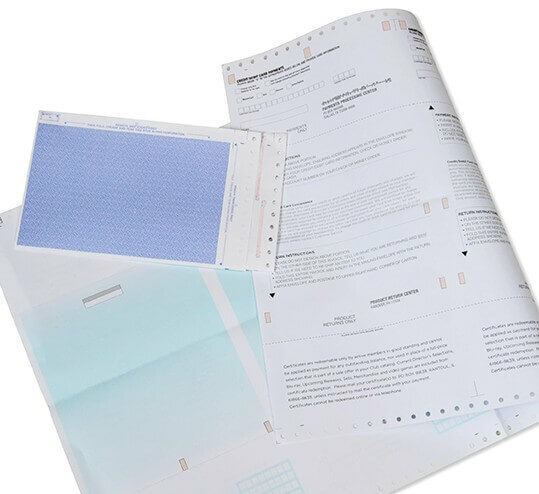 NOTE: Paper selection is dependent on specifications of the printer and equipment used. Coupons, payment slips, address change notices – you name it and we’ll work with you to design the application.